A phone number seems so insignificant. When we dig deeper though, a phone number can be how your future clients reach your new business. You know, that one that you’ve been day dreaming about creating for years now. But, something always gets in the way of you making a dent in the universe. 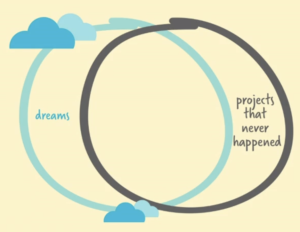 Entrepreneur Bel Pesce, in her TEDTalk 5 Ways to Kill Your Dreams, investigates the overlap between the dreams we have and projects that never happen. Pesce breaks down 5 myths that often dictate reasons why so many of us never take that first step. Check out these ideas below – perhaps you subscribe to one (or all) of these myths and by doing that, you are limiting your ability to ever begin at all. You’ve heard the stories of the app developer that releases a new product and it makes millions when sold only a few months later. You don’t have ideas like that. You can’t think of something that is going to make such an impact, so quickly, so you just throw in the towel before you begin. However, if you talk to that app developer, you learn that they created 30 apps over the last two decades. You didn’t hear about them because they were not wildly successful. But, they played a role in the developer’s knowledge. This app developer was also in school for a PhD, wrote a masters about this idea and spent hours upon hours reading and learning. An overnight success story is always a result of everything you have done in your life up to that moment. You know who has the best answers for you? YOU do. No one else has the perfect answers for your life, goals or dreams. There are many paths you can take. You’re going to bump into walls and fall down unexpected holes. No matter what anyone else tells you, you must navigate through the tricky unknowns on your own. Sure, you can still ask questions. But, waiting around for someone to tell you exactly what to do is only going to stunt your dreams. You believe that when growth is guaranteed…you’ll finally get to settle down. When you’re growing towards a peak, you often need to work harder to reach the next peak. There is always something new to learn and a new avenue to turn down. When it comes to making a dream a reality, there is no time to settle down and believe that you’ll always be smooth sailing along. You believe that someone else is at fault…for you not accomplishing your goals. Have a great idea but because no investor gives you money, you throw your idea in the trash? If you have dreams, it is your responsibility to make them happen. The actions of others that happened or did not happen cannot hinder your ability to make a dream real. If an investor did not decide to help you, perhaps there is more research needed on your product or service. Or perhaps you were not talking to the right investor. How can you take ownership of your dream and not give up? You believe that the only things that matter…are the dreams themselves. Life is never just about the dream itself. Life is about the journey you take to make that dream a reality. Many believe that once a goal has been accomplished, unicorns, rainbows and glitter rain will appear from the heavens. While yes, you should absolutely celebrate your success, don’t forget that the celebration itself is momentary. A dot on the map. Your life is not just one moment. It’s a collection of many moments. When you enjoy every step of your journey – even the trips and stumbles – you’ll enjoy celebrating that moment of success even more. If you believe all of the above, congrats! You will absolutely destroy your dreams. Next Next post: Looking to Port Your Number and Forward Your Calls?